V&A Waterfront wanted to manage their guest to find parking spaces faster and easier. They also wanted to utilize their parking to the full extend. 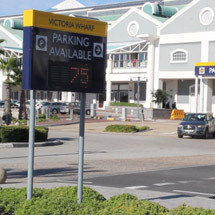 Customer satisfaction is a critical to the V&A waterfront and therefore they decided to implement the Glance Parking Guidance System from SATT and Applied Information Inc. The V&A Waterfront has multiple parking facilities spread out around its property which makes it critical to direct the motorists to the correct parking facility. The idea behind Glance Parking is to guide the motorist step by step to the first available parking space. We do this by providing the motorist with parking information at each decision point and guide them directly to the available parking space. The V&A Waterfront project also included integration to the EOH parking sensor PC. This provided parking information to the Glance Parking Guidance system on spaces that did not have the parking guidance sensors. The EOH system counts the number of people entering and exiting the parking facility to estimate the number of parking space available. This information together with the parking guidance sensors is aggregated by the Glance Parking Guidance System and then displayed on the external VMS signs around the Waterfront facility.